Jesse, Pete and I paddled Cedar Creek years ago. Or, I should say we tried to paddle Cedar Creek.. We actually managed to get downstream past most of the big drops on this run before we ran out of daylight and had to hike off the run, never to return. Until now. Fast forward five years or so and we were sitting on the biggest spring snow pack in recent memory. 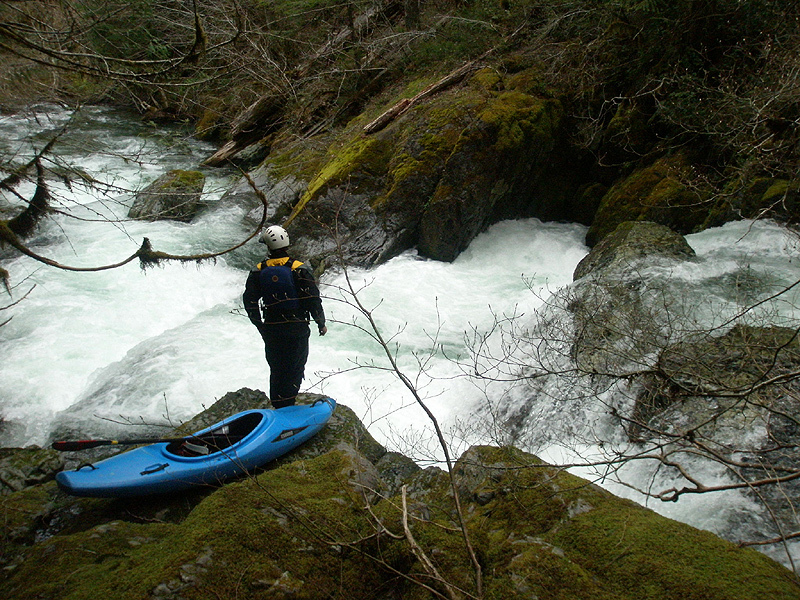 Pete and I had just finished a nice spring run down nearby Opal Creek at 1,500 cfs, and when we passed the mouth of Cedar it looked runnable. Pete immediately started talking about finished up Cedar, and I was ready to give it a go. The bottom mile of this run had been on our minds for the last five years, and we wanted to give it a go and finish the run, after all this time. "For the sake of Completeness", as Pete would say. We ran the shuttle for Opal and hustled up the road that runs parallel to Cedar. 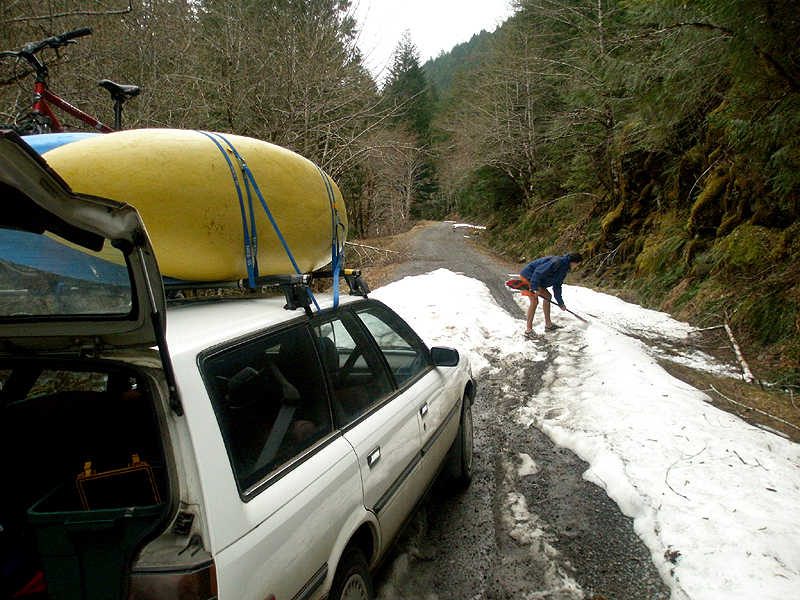 About three quarters of a mile upstream we ran into a patch of snow that required some digging. No problem, paddles make passable snow shovels and we were soon through the drift and headed upstream. Digging past a snow pile on the road to Cedar Creek. This road pretty much always has snow on it when the creek is high enough to run. We continued up past the snow drift, driving slowly and listening for abnormally loud roars filtering through the trees from the creek below. We heard one such roar near a primitive campground and stopped to scout a ledge that looked good to go, then headed upstream again. Just add kayakers.. checking the runout below the steep stuff on Cedar Creek during the shuttle. Finally we located Box Drop, which is just downstream of one of the three big, nasty drops on Cedar. Just to be sure we hiked upstream from Box, and located the last big nasty drop. We climbed down from the road and scouted Box Drop itself, which we had only given a cursory glance five years ago during our hike out in the dark. Box looked appropriately horrible at this flow, with the creek-left side dropping into an undercut wall and the creek-right side dropping into a boxed-out rock wall with face plant written all over it. With a bit more water the center line off Box would be good to go though, as you can see in the photo below. Pete checks the action below Box Drop from our seal launch platform. We opted to put in here because we took out here when we ran out of daylight, the first time we attempted this creek. We seal launched into Box Drop and headed downstream. The first thing we noticed is that Cedar is really, really steep. And scenic. The water is crystal clear and the geology is awesome. If it weren't for the series of completely nasty drops upstream, and the fact that the road almost always has snow, this one would be a local favorite. Soon we arrived at the campsite ledge. We boat-scouted this one because we had looked at it during the shuttle and it looked fine..
Pete runs the campsite ledge. Downstream of the Campsite ledge the creek resumed its busy nature, then we came to another bedrock horizon line that marked the entrance to the final big boulder garden we had seen during the shuttle. I ran the ledge first and then shot photos as Pete ran the ledge, then floated by around the corner and out of sight..
Pete drops into the final big boulder garden, which goes on for about a hundred meters, around the corner. At the bottom of the final big boulder garden we had to portage a couple of logs, then the creek got all braided out just above the confluence with Opal Creek. The combination of these two events completely killed any buzz we might have had from the fun stuff upstream, and once again soured our opinion of Cedar Creek.. This one is awfully tempting from the glimpses you get from the road while doing the shuttle, but it is probably more trouble than it is worth in my opinion. 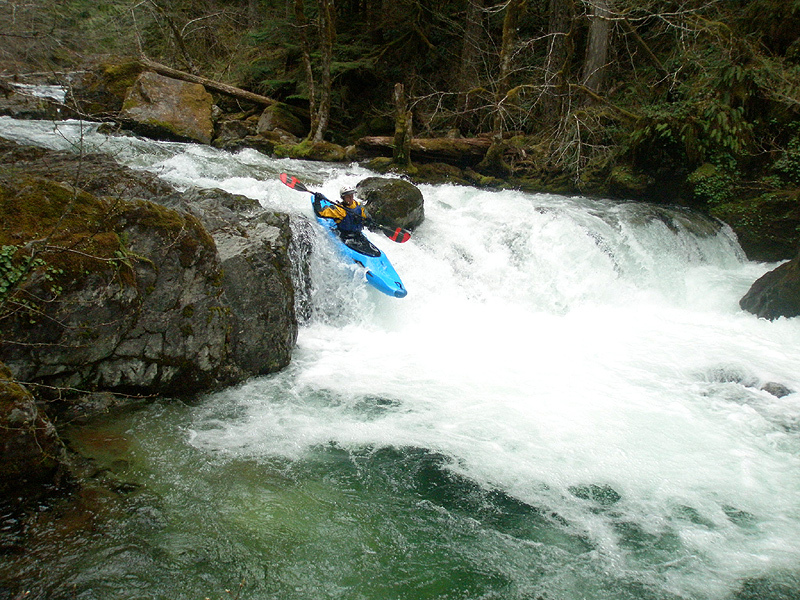 Taking off of Cedar Creek, at the confluence with Opal Creek. 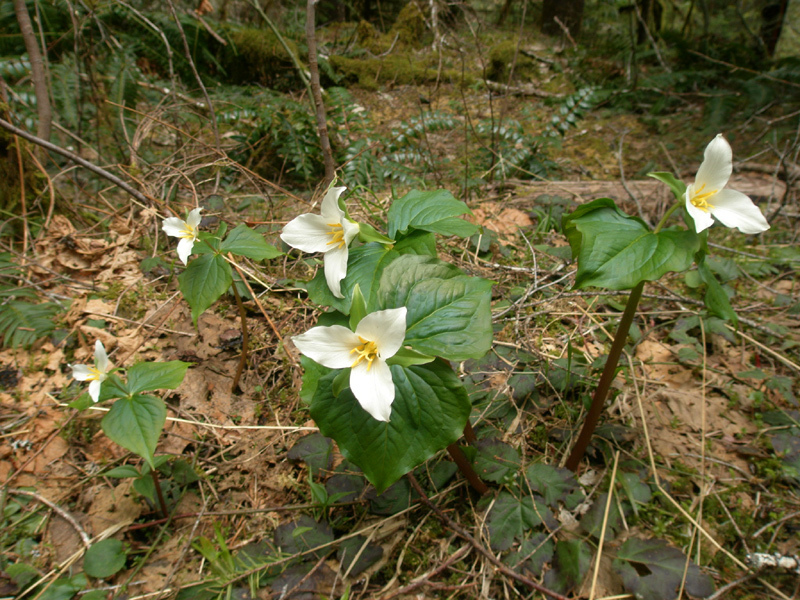 I saw these rare Trillium growing on the side of the road while I was hiking the shuttle. It is actually illegal to pick these in Oregon and Washington because the three leaves on each plant are their only source of nourishment. If you pick them the plant will die and/or take years to recover. Cedar Creek is generally not recommended. 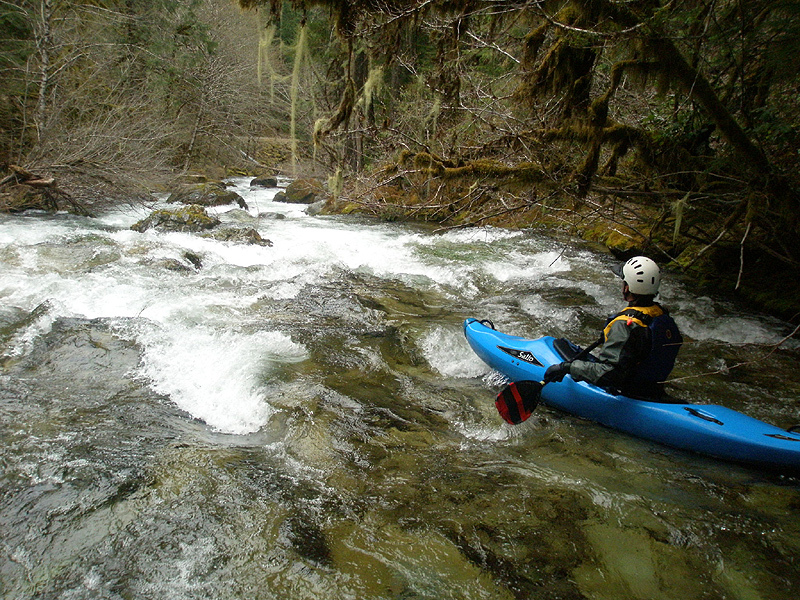 This creek is steep, congested, and has some really nasty rapids that have few or no eddies above them. You should only attempt Cedar after carefully scouting along the banks during the shuttle. The farther upstream you go the meaner it gets. 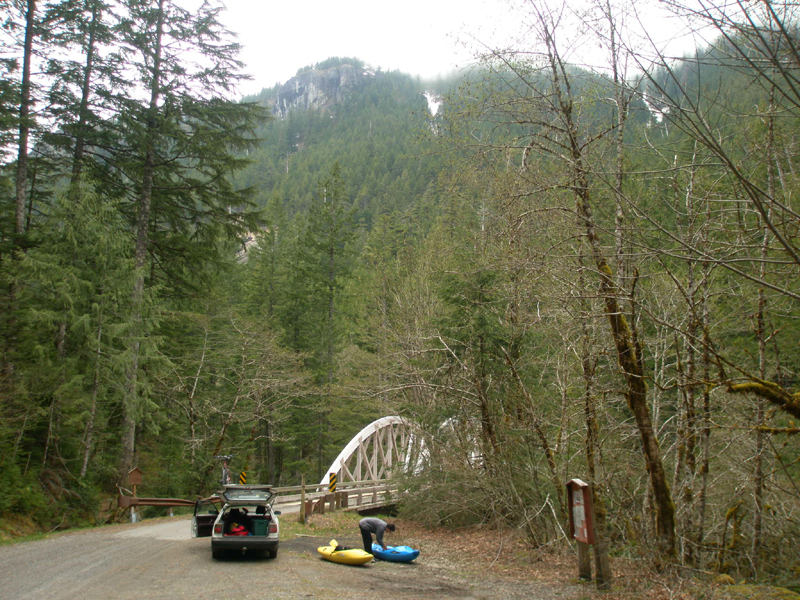 Here's the trip report from 2003 on the Upper section of Cedar Creek. 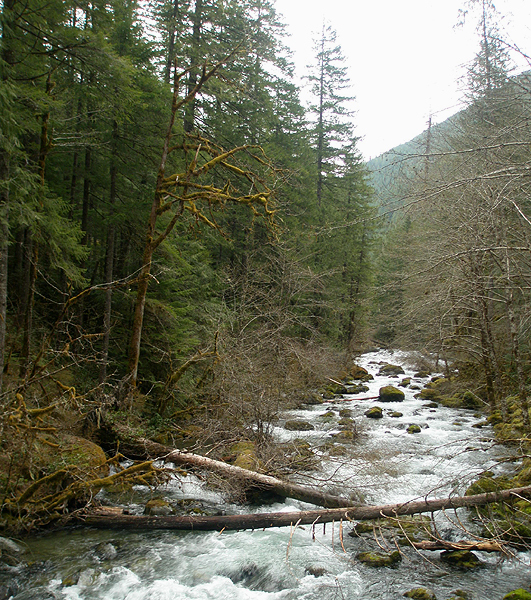 Flows: You need at least 2,000 cfs in the Little North Santiam at Mehama. Cedar Creek. 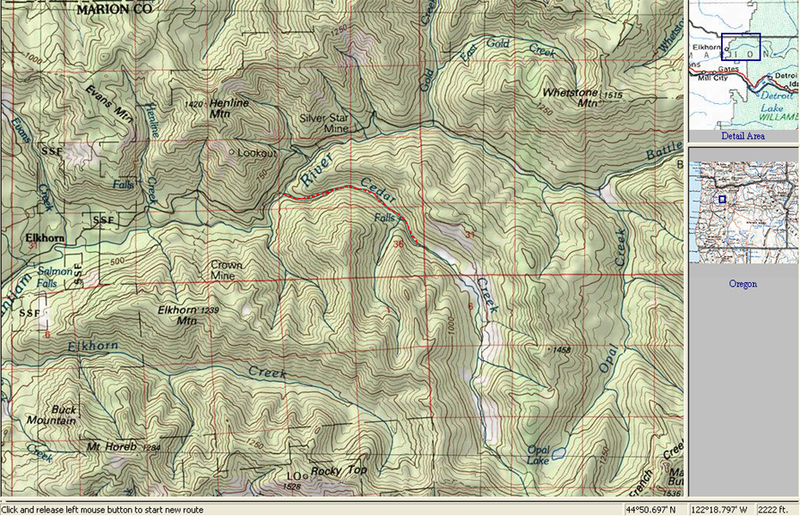 The red line shows the main run, the bottom mile of which is described in this trip report.